Two years after the conflict escalated, medical and humanitarian needs in the Arab country are huge and aid organisations have many problems providing assistance. Candelaria Lanusse is a Médecins Sans Frontières health adviser for Yemen and has just returned from a field visit to the projects in the northern governorate of Hajjah and in the capital, Sana’a. How is the conflict affecting Yemen? The escalation of the conflict in the country is hitting the population hard. The data speaks for itself. More than 18 million people are in need of humanitarian aid, some three million are internally displaced and tens of thousands have died or been injured. The civilian population is paying a very high price. The war is also having other effects: fear, scarcity of food, rising fuel prices. Many people have often been displaced more than once. They have had to leave everything behind. There are few who have not lost loved ones. What are the main problems and needs at the medical and humanitarian level? The lack of security due to the fighting and bombing makes it difficult to provide assistance, and the problems of access, due to restrictions or delays in permits for some humanitarian actors, is also a disadvantage. People are totally dependent on aid, the economic activity has been greatly reduced. Another very worrying issue is that cases of preventable infections such as whooping cough are appearing more frequently. This is a reflection of the collapse of the health system, which has left vaccination coverage well below standards. The combined factors of fighting, import restrictions and non-payment of salaries to public officials in the north are having a serious effect on access to food. In addition, there is a lack of access to nutritional treatments and the distributions of food are irregular and erratic. "But not only hospitals have been attacked; many other civil infrastructures such as markets or social gatherings have also been targeted"
There is also a high risk of acute malnutrition and starvation on the population. The UN figures are shocking. 1.1 million breastfeeding women are malnourished and 462,000 children under five are suffering from severe acute malnutrition. It is difficult for Médecins Sans Frontières to make a conclusive analysis. On the one hand, the deterioration of the situation is evident as people have been displaced and lost their livelihood, their crops or animals. On the other hand, only the most severe cases of malnutrition arrive at our hospital and we do not do ambulatory care, so we do not have the full picture. 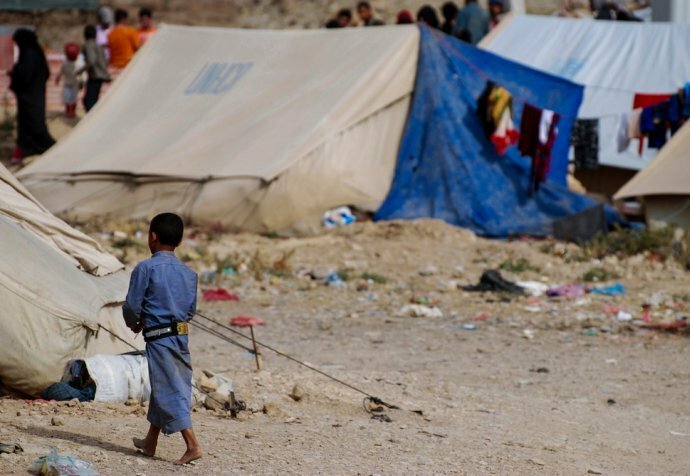 How has the conflict also affected aid organisations? Dozens of health facilities have been destroyed in attacks or combats. Four Médecins Sans Frontières hospitals were hit by airstrikes or shelling between October 2015 and August 2016, which forced the temporary evacuation of personnel and the disruption of services. But not only hospitals have been attacked; many other civil infrastructures such as markets or social gatherings have also been targeted. Nevertheless, people have integrated the violence into their daily life and continue to go to hospitals if they can receive medical attention, always dependent on the frequency of bombings in the area where they find themselves. In Yemen, Médecins Sans Frontières works in the governorates of Ibb, Taiz, Sa'ada, Hajjah, Amran, Aden, Al-Dhale and Sana’a. From the escalation of the conflict in March 2015 until December 2016, Médecins Sans Frontières treated more than 56,000 war wounded and carried out around 29,000 surgeries. More than 23,400 babies were born in childbirths assisted by our teams. Yemen: "Our colleagues are often going through personal hell"